Who uses NASA Earth science data? Dr. Laura Bourgeau-Chavez, for studying wetlands and wildfire. 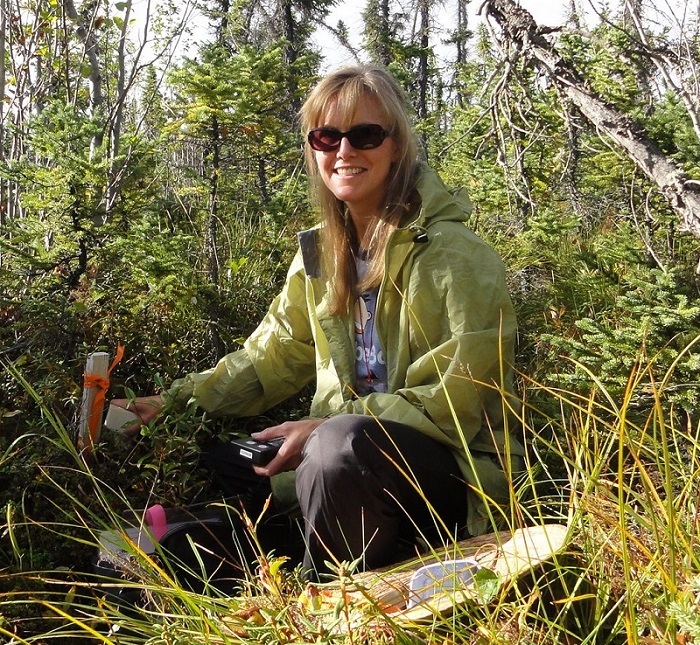 Research interests: Using field and remote sensing data for mapping and monitoring wetlands in tropical, temperate, and boreal ecozones; evaluating the potential for wildfire; and assessing the effects of wildfire in boreal-arctic regions. Research highlights: From the jungle to the tundra to isolated lakes in the U.S. Upper Midwest, remotely-sensed data enable scientific investigations in areas that are difficult—sometimes impossible—to access. However, investigations using remotely-sensed data can benefit from boots on the ground. These field campaigns allow scientists to connect remotely-sensed data with real-world processes and improve sensor algorithms to create more accurate data products. For example, the recent Soil Moisture Active Passive Validation Experiment (SMAPVEX16) in the farmlands of Iowa and Manitoba helped improve algorithms used to process the Soil Moisture Active Passive (SMAP) mission data. Using field investigations to connect ground observations with remotely-sensed data and to improve sensor data algorithms are also important elements of Dr. Laura Bourgeau-Chavez’ investigations into wildfire, soil moisture monitoring, and wetlands. 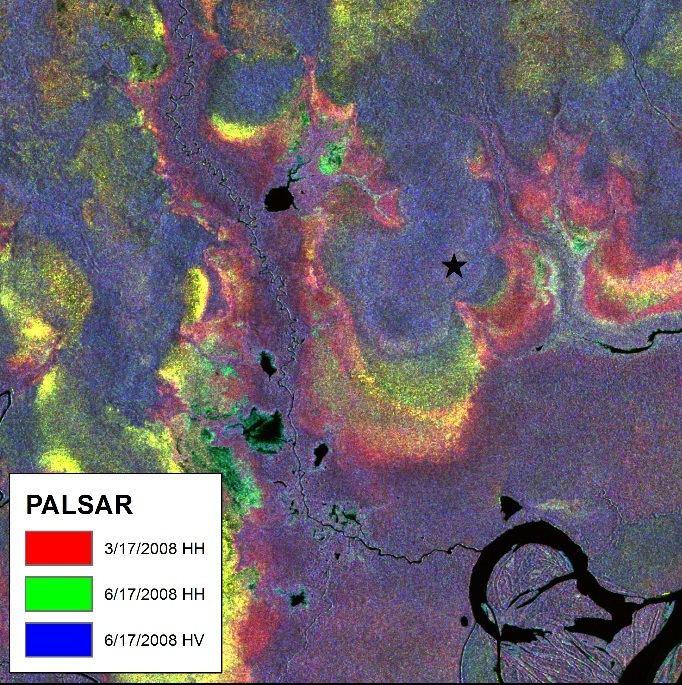 Example of a three-date false color composite of Phased Array type L-band SAR (PALSAR) imagery over the lowlands of Peru. The yellow, pink, and green colors in this derived product represent different hydrological conditions on the various dates and highlight different wetland types. Image © JAXA/METI 2008 and courtesy Michigan Technological University. A key remote sensing technology used by Dr. Bourgeau-Chavez is synthetic aperture radar, or SAR, which is well-suited for her work in remote areas that include the Great Lakes, Alaska, Canada, and South America. SAR is an “active” radar system, and creates an image by bouncing a microwave radar signal off Earth’s surface to detect physical properties (“passive” radar, such as a radiometer, sense energy radiated from Earth and do not send out a radar pulse). Since SAR relies on reflected microwaves to create an image, it does not need illumination from an outside source. In addition, the wavelengths used for creating SAR imagery penetrate clouds, smoke, and even tree canopies. This allows SAR imagery to be created day or night, rain or shine. SAR sensors most commonly use L-band (24 cm wavelength), C-band (6 cm wavelength), or X-band (3 cm wavelength) radar. The sensor wavelength determines the penetration depth of the transmitted signal; the longer the wavelength, the deeper the penetration. For Dr. Bourgeau-Chavez’ wetland research, L-band SAR can peer through tree canopies and other dense vegetation to reveal standing water underneath. NASA's home for SAR data is the Alaska Satellite Facility Distributed Active Archive Center (ASF DAAC), and Dr. Bourgeau-Chavez utilizes ASF DAAC SAR data from several U.S. and international missions in her research. Currently, Dr. Bourgeau-Chavez is working on two wildfire projects in the boreal-arctic regions of Alaska and western Canada. One project focuses on developing satellite data products to monitor drought conditions to better predict wildfire danger and wildfire behavior. Using both active and passive radar, Dr. Bourgeau-Chavez and her colleagues are developing fuel moisture algorithms to augment existing weather-based systems used to predict wildfire danger. Fuel moisture is a measure of the amount of water in a fuel source (such as organic soil or ground layers) that is available to a fire. Higher amounts of moisture in organic soil layers and vegetation can make it more difficult for the fuel source to heat to its combustion temperature. Remotely-sensed data are a valuable addition to field data, especially for research in remote areas. 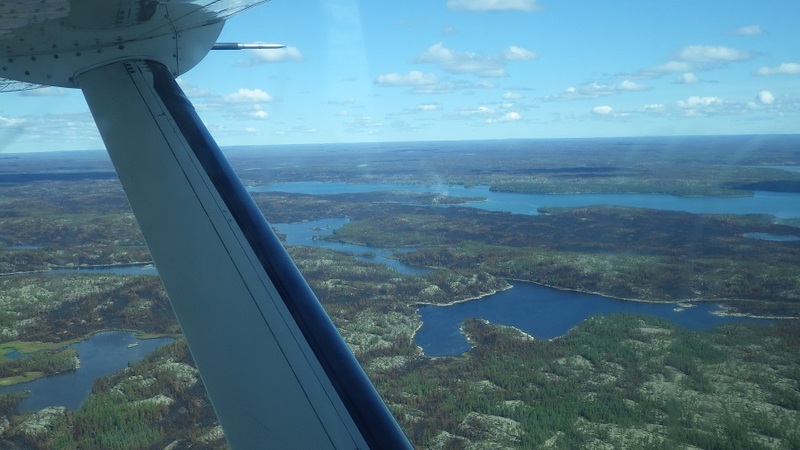 This image was taken by Dr. Bourgeau-Chavez from a float plane east of Yellowknife NWT, Canada, and shows areas where she is collecting field data as part of a wildfire study. At least one active wildfire can be seen ahead of the wing strut as a wisp of white smoke; burned areas are darker areas. Image courtesy of Dr. Bourgeau-Chavez. Her second boreal-arctic project is part of the Arctic Boreal Vulnerability Experiment (ABoVE) field campaign. ABoVE is a large-scale study in Alaska and western Canada that connects environmental change and its implications for socio-ecological systems in this region. Dr. Bourgeau-Chavez’ ABoVE work examines the vulnerability of boreal and arctic ecosystems to wildfire, emphasizing peatlands. Noting that the effects of wildfire in peatlands are largely unknown, she points out that two variables contributing to post-fire plant succession in peatlands are burn severity in the canopy and ground layers along with post-fire soil moisture. She and her colleagues are using radar and optical data along with data from the joint U.S. Geological Survey (USGS)/NASA Landsat missions to develop remote sensing algorithms to map peatland types and ground burn severity, as well as to monitor peatland soil moisture and drought. Data from extensive field sampling can train the algorithms to more accurately reflect sensor data and provide a better understanding of post-fire vegetation ecology. Dr. Bourgeau-Chavez also evaluates using the SMAP radiometer for monitoring fuel moisture for fire danger prediction. She found that while SMAP soil moisture products adequately reflect fuel moisture across boreal North America, these fuel moisture estimates can likely be improved and applied to smaller-scale areas by merging the passive SMAP radiometer data with active radar data. Dr. Bourgeau-Chavez’ multi-institutional (Michigan State University, University of Michigan, and Michigan Technological University) and interdisciplinary research team has shown that increases in nitrogen in coastal zones along the Great Lakes trigger the spread of P. australis. Control of the plant requires a holistic watershed approach to reduce nitrogen loading while simultaneously treating invaded wetlands with a combination of herbicide and removing P. australis biomass through mowing and burning. Monitoring and mapping the effects of this management approach requires an integration of field data with data collected using unmanned aerial vehicles (UAVs), aircraft, and satellites. For wetland mapping, Dr. Bourgeau-Chavez and her colleagues found that L-band and C-band SAR data, combined with optical imagery from multiple seasons, can produce maps with individual wetland class (e.g., emergent, wooded bog, or wetland shrub) accuracies of 80% or higher. Finally, in what she calls one of her favorite projects, Dr. Bourgeau-Chavez and her colleagues developed methods using LIDAR (Light Detection and Ranging) digital elevation models and seasonal L-band radar data to detect and map woodland vernal pools in Michigan. Vernal pools are small (typically less than 1 hectare/2.47 acres in size), shallow, isolated, temporary wetlands that are important for maintaining healthy forest ecosystems. Their chief characteristic is that they are ephemeral—they exist for variable periods from winter to spring, but may be completely dry for most of the summer and fall. Vernal pools provide critical breeding habitats for amphibians and invertebrates, including a number of rare and declining plant and animal species as well as obligate species that rely on or are restricted to vernal pools to complete their life cycle. Due to their small size and temporary nature, these fragile ecosystems are easily disturbed. In collaboration with the Michigan Natural Features Inventory, Dr. Bourgeau-Chavez and her colleagues are working on a database of Michigan’s vernal pools to better conserve and protect these ecologically sensitive areas. For Dr. Bourgeau-Chavez, the integration of field research and remotely-sensed data improve sensor algorithms and help produce a deeper understanding of the ecological aspects of the areas in which she and her colleagues conduct research. These boots on the ground provide a critical link between real-world processes and data sampled from high above Earth. Bourgeau-Chavez, L.L., Endres, S., Powell, R. Battaglia, M.J., Benscoter, B., Turetsky, M., Kasischke, E.S. & Banda, E. (2017). “Mapping boreal peatland ecosystem types from multitemporal radar and optical satellite imagery.” Canadian Journal of Forest Research, 47(4): 545-559 [http://doi.org/10.1139/cjfr-2016-0192]. Bourgeau-Chavez, L.L., Lee, Y., Battaglia, M., Endres, S., Laubach, Z. & Scarbrough, K. (2016). “Identification of Woodland Vernal Pools with Seasonal Change PALSAR Data for Habitat Conservation.” Remote Sensing, 8(6): 490 [http://doi.org/10.3390/rs8060490]. Bourgeau-Chavez, L.L., Endres, S.L., Battaglia, M.J., Miller, M.E., Banda, E.C., Laubach, Z.M., Higman, P., Chow-Fraser, P. & Marcaccio, J. (2015). “Development of a Bi-National Great Lakes Coastal Wetland and Land Use Map Using Three-Season PALSAR and Landsat Imagery.” Remote Sensing, 7(7): 8655-8682 [http://doi.org/10.3390/rs70708655]. Bourgeau-Chavez, L.L., Kowalski, K.P., Carlson Mazur, M.L., Scarbrough, K.A., Powell, R. B., Brooks, C.N., … Riordan, K. (2013). “Mapping invasive Phragmites australis in the coastal Great Lakes with ALOS PALSAR satellite imagery for decision support.” Journal of Great Lakes Research, 39:65–77 [http://doi.org/10.1016/j.jglr.2012.11.001]. Bourgeau-Chavez, L.L., Leblon, B., Charbonneau, F. & Buckley, J.R. (2013). “Evaluation of polarimetric Radarsat-2 SAR data for development of soil moisture retrieval algorithms over a chronosequence of black spruce boreal forests.” Remote Sensing of Environment, 132: 71-85 [http://doi.org/10.1016/j.rse.2013.01.006].